This third and last blog about the Mt. Everest area deals with the paleontology of beds at Nyalam that are more accessible but age equivalent to the fossiliferous beds found at Mt. Everest. Nyalam is near a highway and 70 mi. (120 km) west of Mt. Everest. I used my figure again to help you keep track of the rock units of the Nyalam and Mt. Everest, with especial attention to the fossiliferous sedimentary rocks capping the latter. Paleontologists have been able to trace the Everest fossiliferous sequence to the west (at more accessible altitudes) about 110 km (75 mi.) 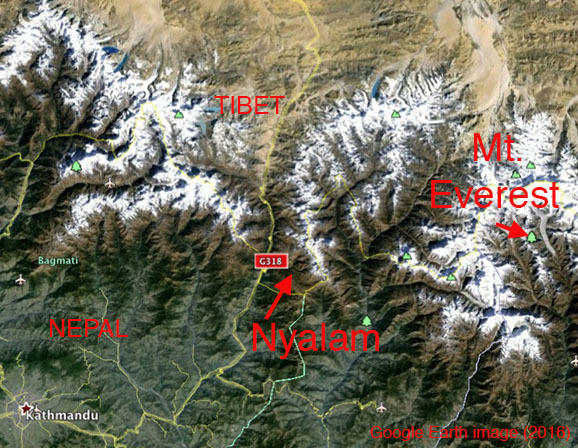 within the Chinese Nyalama area, very near the Nepal-Tibet border and northeast of Kathamandu. 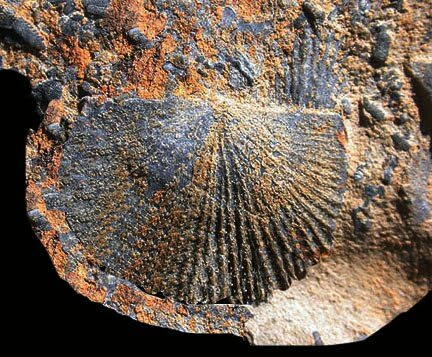 The Nyalama sequence is contemporaneous in age with the sedimentary sequence exposed near the summit of Everest, and the Nyalama beds, which are in the lower part of the Chiatsum Group, are rich in brachiopods, crinoids, crinoids, and reportedly some cephalopods. Work by Harper et al. 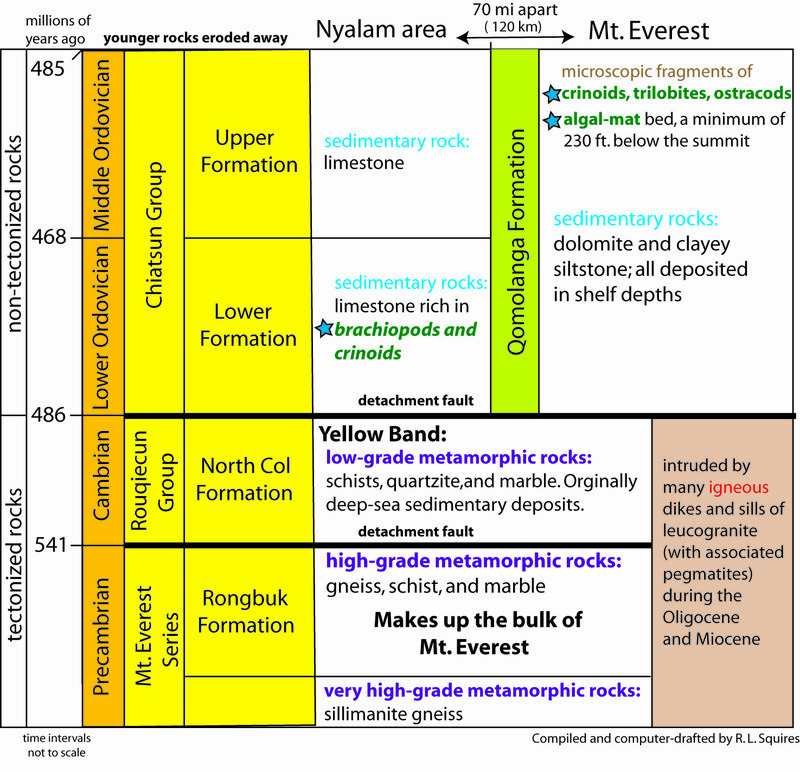 (2011) in the Nyalama area has shown that the entire upper part of the Everest rock sequence above the distinctive "Yellow Band" consists of Ordovician carbonates over 200 m thick, which are correlative to the lower part of the Chiatsum Group, which is called the Qomolangma Formation at Everest. Conodonts in the lower Chiatsum Group in the Nyalam beds are indicative of the upper Darriwilian interval (upper Middle Ordovician). The lower Chiatsum Group in the Nyalam area represents a transgressive marine succession comprised of cycles of mid-shelf bioclastic limestones and peritidal dolomites. The entire succession was deposited in mid-shelf to deep sub tidal depths in warm, subtropical waters that were present in a low-latitude region about 30°S, in proximity to India. Work by Harper et al. 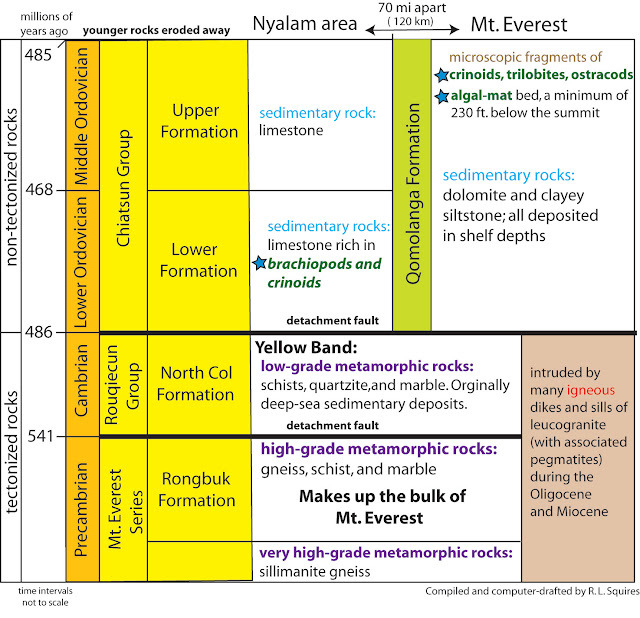 (2011) in the Nyalam area [you can get a free pdf of this article by clicking HERE , then scrolling down to pages 214–220] has shown that the entire upper part of the Everest rock sequence above the distinctive "Yellow Band" consists of Ordovician carbonates over 200 m thick, which are correlative to the lower part of the Chiatsum Group, which is called the Qomolangma Formation at Everest. In this article, there is also information concerning the macrofossils (visible to the eye) found at Nyalama. Aporthophyla perelegans Liu, 1976 from the lower Chiatsun Formation in southern Tibet (diagram from Zhan et al., 2014. You can get a free pdf of Zhan et al., 2014, by clicking HERE and then click on "download full text." This brachiopod is Orthambonites sp. from Middle Ordovician rocks, Badger Pass, Death Valley, Inyo County, California. This genus, which occurs in the Nyalam area west of Mt. Everest also occurs elsewhere in the world.